If you pastor a small church or consistently feel the pangs of ministerial discouragement or secretly wonder if the small numbers in your assembly are due more to your incompetence, read Memoirs of an Ordinary Pastor and find encouragement. What a paradox. 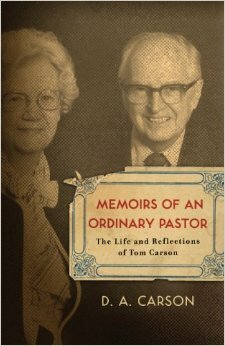 Carson records his father Tom’s oft-discouraging ministry in French Canada to uplift very ordinary pastors today. Two thoughts come to mind. First, how wonderful it would be if our church actually had bulletins. Second, I have paced miles before Sunday services wondering similar things: is our fledgling flock due to the shepherd or the sheep? Tom Carson’s French was much better than his wife’s, but this wasn’t due to his greater intelligence; Don implied the opposite was true. But Tom spent so much time in the French language—through visitation, study and preaching—that he was able to gain a serious advantage on his wife who stayed home to rear the children. This should lead ministers, and especially foreign missionaries, to be patient with their wives who take significant time to learn the language; husbands should heap praise upon them if they succeed. Missionaries struggle to know the correct balance here. If we address too many discouragements in our reports, we’ll appear negative and cynical; if heavy handed with glowing advances, we will look unrealistic. Six great lessons from what appears to be a very helpful book. Thanks. Thanks Paul that was helpful.